Last week our 7th & 8th grade class headed to Boston, MA, on our first “Adventure Trip.” It took a lot of planning (thankfully, TNCA mom Bridget Felix took on that task), a lot of work in fundraising, and a lot of time spent in cars, buses, trains, and planes, but our trip was a complete success in all the ways that we had hoped. 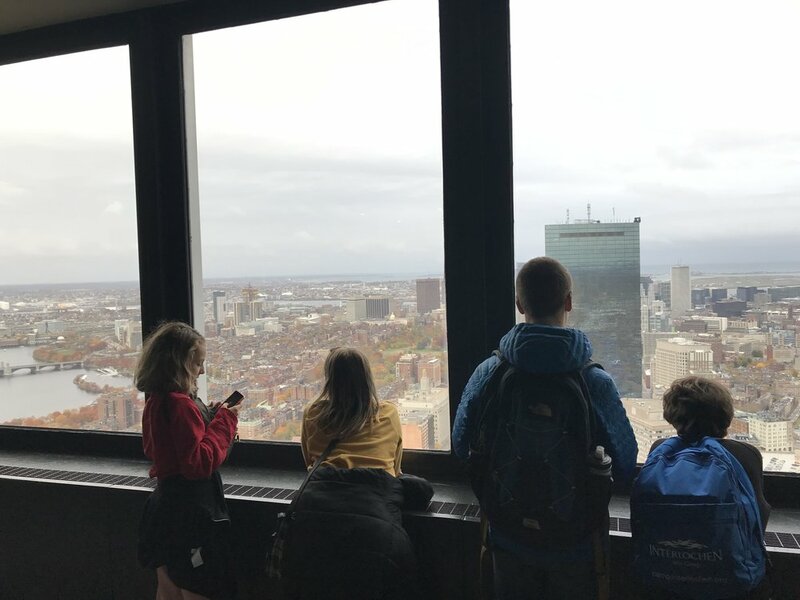 We chose Boston as our destination because of the role it played in the American Revolution, our topic of study this session in American History. We wanted to bring history to life for our students in a way that lectures, videos, and classroom activities simply cannot achieve. So in Boston, we walked the Freedom Trail - for miles. We saw the graves of members of the Sons of Liberty whom we had read about. We sat inside the Old South Meeting House, where those very men discussed, argued, and planned. We explored Paul Revere’s house, and climbed the narrow staircase of the Old North Church, where the two lanterns hung to give the signal that the British were heading to Concord over the Charles River. We stood on the site of the Boston Massacre and walked through the replica ships of the Boston Tea Party. We explored museums, listened to tour guides’ stories, and even got to play around with some props. By the end of the trip, we were revolutionary-era Boston experts. But that’s not what our students will remember most about this trip, and we didn’t design these trips with only history in mind. We want to expand our students’ horizons in every direction by showing them the bigger world that awaits them outside of Asheville, NC. Fortunately, Boston has a lot to offer in that way. They will remember learning how to use the subway and walking at night through the winding streets of the North End. They’ll remember trying Vietnamese food in Chinatown and going out for gelato in Little Italy. They experienced the sites and sounds and smells of a big city, and it made an impact on them that was exciting to see. We could see their confidence grow as they figured out which trains to take or how to order their bubble tea or when not to buy a souvenir. And they’ll remember driving each other crazy with pictures and videos, watching movies in our Airbnb, and laughing hysterically together. This trip was a wonderful way for us to bond as a group, as fellow adventurers and travelers. And it was a great way for our students to learn about the world and the opportunities that await them.